We all like the rough and ready image of someone swinging the axe and splitting wood that comes our way via Hollywood. We like to think ‘I could do that’ and most of us would be right. But for how long? Swinging an axe over and over again really isn’t good for your back and shoulders can quite easily cause injuries, especially as we get older. Splitting wood with an axe is also very time consuming and most of us lead very busy lives these days and just don’t have those hours to spare. If you use timber as the main way to heat your home, say with an open fireplace, or you just like to sit around a campfire and have a beer or two with some friends, then it might be worth investing in a log splitter. Many people rent log splitters on a part-time basis, but with their prices becoming more and more affordable, it might work out cheaper in the long run to purchase your own. So what are your options? There are three main types of log splitters- manual, electric, and petrol. I’ll quickly go over each one now to give you an idea of the differences between them. These log splitters rely on manual labour rather than a power source. There are different designs of manual splitters, some are hand operated, and others are foot powered, some require a fair bit of man power, and others have hydraulics to make this easier. Manual log splitters are the cheapest type and lightest of the three varieties but they are also the most labour intensive. If you have to split timber on a regular basis and/or in large quantities you’d probably be better off paying the extra for an electric or petrol powered log splitter, but if you only occasionally require one, a manual log splitter may be the one for you. Electric log splitters are powered by an electric motor which, in turn, powers the hydraulics that splits the wood. They are very popular for a number of reasons. First, they don’t produce fumes or emissions so they are better for the environment and can also be used indoors. A god send in cold, rainy weather. They also require a lot less maintenance than petrol powered splitters, are generally lighter and more compact and don’t require you to fill them up with a fuel source, an everyday wall socket is all you need. Electric log splitters are usually not as powerful as petrol ones, so if you need particularly thick wood splitting, they might not be the best choice. Also you have to cut your wood near to the power socket, and are held back in range by your power cord. The most powerful and most expensive types of log splitters are the petrol kind. These splitters can deal with larger logs that electric log splitters can’t. They also give more freedom of movement because they don’t need to be connected to a power source by a cable. However, as I already mentioned, petrol log splitters can’t safely be used indoors because of the fumes. There is also the cost factor. Apart from the generally higher asking price, you also need to pay for petrol to run them and there are also maintenance costs. That being said, if you have to split a lot of wood in a hurry or deal with some large diameter logs, you can’t beat a petrol machine. Prices at 49.99, the longmaster foot operated model is probably the best choice for a cheap log splitter that costs under fifty pounds. As the name suggests, this log splitter is operated manually by foot. You can adjust the height (at least 33cm) and then you simply push down hard repeatedly with your foot until the log splits. One step of the foot is supposed to exert a force of up to 1.2 tons of pressure and the manufacturers say that it can split seasoned and green wood logs and at a maximum size of 45.7cm in length and 25.4cm diameter. I found that it handled soft, freshly cut wood easily enough but hardwood was a lot more of a struggle and required a fair bit of elbow grease. The build quality is ok but not great. The log splitter’s frame is made from heavy duty steel and feels sturdy but some parts of it like the ratchet, and the hinge that holds it in place, don’t seem to have been made to the same quality. Then again, for 50 pounds you expect a few little annoyances, but it still makes we wonder about this log splitter’s lifespan. The frame folds away for easy storage and at just under 10 kilograms it’s not too heavy to carry around. 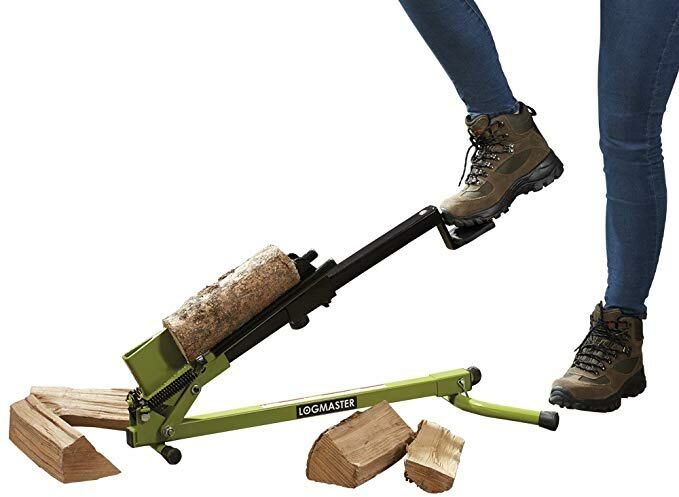 The logmaster foot operated log splitter is very easy to use and maintain. A little anti-rust machine oil on the working parts from time to time should suffice. This log splitter needs to be placed on a flat, hard surface to work properly and it will do a decent job, but it will struggle with logs with knotted growths and get stuck and have to be prized off the blade. The logmaster foot operated log splitter is decent enough tool if you’re only using it occasionally and splitting soft or seasoned wood. Knotted, or hardwood logs will be too much of a task for it though. The Swedish log splitter for AGMA is for sale on Amazon priced at £86.90. This manual log splitter works in a different way to our previous review, which was foot operated. Instead the Swedish log splitter requires you drill a hole of 12cm deep and 8cm from the edge, into a base log. Then you insert the guide rod into the hole. This needs to be perpendicular to the ground to aid the support of the guide rod or it might unbalance. You lift the handle of the splitting wedge and place a log under it. You then lift the striking weight and release it so the wedge embeds itself in the log. Finally you lift the weight again and throw it down to split the log. Repeating the final step as many times as necessary. It’s a very simple device that works very well in most cases and only really has problems splitting knotted logs. The splitting action of the device is a bit slow and time consuming but it certainly saves you energy when compared to a foot operated manual log splitter. The dropping ‘hammer and wedge’ splitting action is a great idea and is much safer than using an axe. Precision is another thing the Swedish log splitter has going for it as the design allows you to adjust and decide exactly where the log will split. There is also a feature that lets you cut kindling. Safe and easy to use, the AGMA Swedish manual log splitter has a nice labour saving design, but does require some precise setting up and is rather slow in operation. It’s for sale now at £86.90. 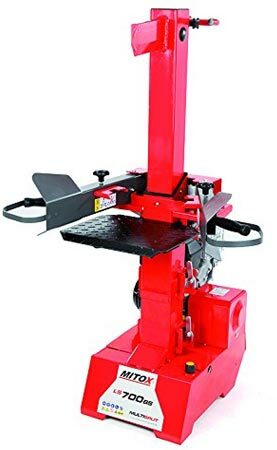 For sale at a price of £176.99, the Forest Master log splitter is actually quite expensive for a manual device and getting into the realm of entry level electric models. For the price though, you get a lot of splitting power. Using a Hydraulic lift jack, this log splitter is able to produce 10 tonnes of force and can be used too split logs up to 51cm long and 30cm in diameter. It can split logs both vertically and horizontally. The twin ‘Duocut’ blade design optimises the performance of this manual log splitter by using two blades instead of one. The Duocut blade works with the Forest master’s stationary blade to comfortably split even knotted wood at a decent pace. The stationary blade is also adjustable and you can set it to start splitting immediately rather than waiting for the weight to drop like the Swedish Slitter we just reviewed. As mentioned, this machine can be used either vertically via a foot pump, or horizontally through the use of hand operated levers. The Forest Master manual log splitter is easy to set up using an allen key, and has a nice safety feature in the shape of a safety valve. This works to stop overloading and damaging the machine. The overall quality of the log splitter is good with most parts being made of strong steel. One thing I will say is that you have to read the instructions carefully as misuse can bend the cradle that holds the logs in place. I feel this could have been avoided by the manufacturers with a few adjustments. I used it vertically, and splitting wise- it worked very, very well. However I had to hold it at the top to keep it stable, a small complaint. I know but something I feel could have been avoided. Then again, I guess you’re trading mobility for stability. Having no need for electric, you can carry this log splitter out to the timber rather than the other way around. The machine is still a little bit heavy and awkward and I think Forest Master should have put some thought into fitting some heavy duty wheels for it to get about on, which would have made things much easier. In vertical position, needs to be held to stabilise. Could do with some heavy duty wheels. Misuse can damage some parts easily so instructions must be followed. Time to move on to some electric log splitter reviews. Like with the manual models, I’ll choose some from different price ranges for you to take a look at. Again, let’s start with the best option at the cheapest price. Most god entry level electric log splitters are for sale at a price over 300 pounds but this little model from the Lumberjack brand can be bought for £242.63 on Amazon at the moment. You might even find cheaper if you shop around. For just under 245 pounds, this is a great product. The modern look of the machine is more aesthetically pleasing than most log splitters, while still remaining practical. It has a streamlined build that will save you storage space and its hydraulic ram is self-lubricating so there is almost zero maintenance required to keep this electric log splitter running. 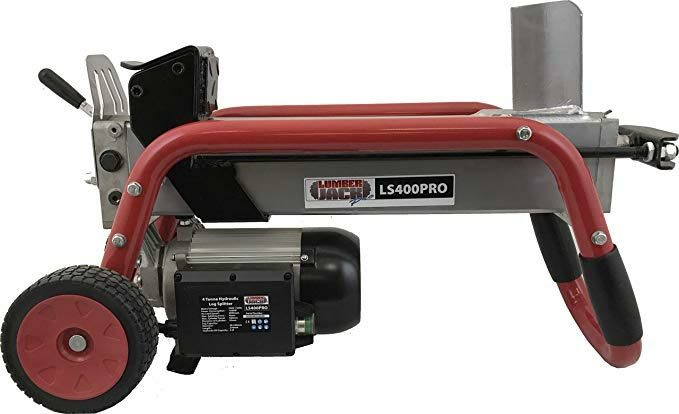 The Lumberjack LS400P log splitter is powered by a 1500w electric motor that gives out 4 tonnes of splitting power and can make light work of logs 370mm long and with a diameter of 250mm. It can handle both greenwood and hardwood logs. This motor powers a hydraulic ram which then compresses the log against a splitting wedge which is made from heavy duty cast iron. This compressing action is safer than any chopping or swinging motion you’d need to employ when using an axe or sledgehammer and works much more efficiently. Like the previous review, this electric log splitter has a load limiting device to prevent damaging the machine and also has two hand safety control as part of the design. Other features are good wheels to transport the log splitter around and an automatically returning hydraulic ram, so there’s no need to get your fingers in amongst the moving parts. It also runs pretty quietly, producing 78 decibels when under operation. The only drawbacks are that this electric log splitter is power hungry and will increase you electric bill noticeably if you use it daily. Also, being electric, it is held back by the fact you can only transport it as far as its power cord will allow you too. Apart from a couple of minor flaws, the Lumberjack LS400P electric log splitter is a nice bit of kit for a reasonable price. Forest Master have brought us another great log splitter at a competitive price. The heavy duty electric log splitter is for sale at £349.99 and has some great features. Let’s start with the motor. Forest Master have fitted their heavy duty log splitter with a powerful 2200 watt electric motor that is capable of 7 tonnes of splitting force. The motor is also meant to be energy saving and doesn’t use electricity when not in cycle. Like the manual log splitter from the same manufacturer, this electric log splitter has the dual blade ‘Duocut’ feature so it can split any type of logs to a maximum size of 430mm in length. This dual blade action makes it great for cutting through knots and it does so with ease. As a safety feature it must be operated with both hands on the controls to make sure your fingers are nowhere near any working parts when the log splitter is working. The heavy duty metal frame is well built and very sturdy, but also heavy at 47 kilograms. It does come with wheels attached and tilting the log splitter on to them allows you to move it around. In my own personal opinion, the wheels could have been bigger. Important to note, this stand must be purchased as a separate item in many cases, although there are deals where it comes included. My biggest gripe is that unless you want back pains, you must buy the stand for this electric log splitter or you’ll be bending over all day. Also, the instructions are badly worded and can be hard to follow. A heavy duty electric log splitter for just under 350 pounds. Not without its flaws but overall a very good performer. Our review is for the best priced petrol log splitter. 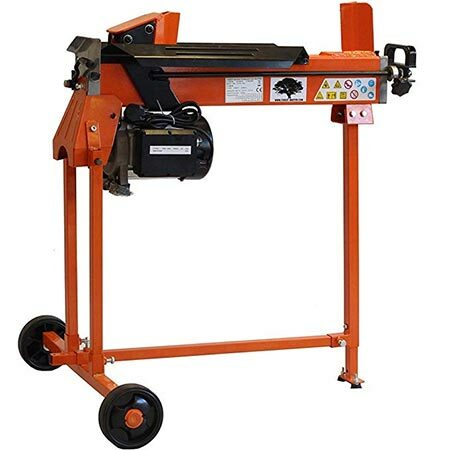 As we mentioned earlier, these machines are for those of you who need to cut through a large volume of wood on a regular basis or have particularly large or difficult logs to split. The Mitox LS700BS petrol log splitter is on sale for £899.00 in the UK and is our choice for best priced petrol log splitter as it comes with a number of features that justify the price. First of all, it is petrol powered which means no power cords, so you can take this log splitter out to where the wood is and get splitting. The 196cc, 4 stroke, Briggs and Statton engine helps to produce 7 tonnes of splitting force for the Mitox LS700BS which is more than enough to tackle all types of logs up to 104cm in length. With this petrol log splitter, you can tailor the splitting stroke to your needs because of the 3 position adjustable splitting table. The Mitox also has a cool, time saving feature called the multisplit wedge. This splits your largest logs into 4 pieces at once and saves the need for splitting multiple times. Like most electric and petrol log splitters these days, it has built in safety features such as requiring you to have both hands on the controls and out of the way of the moving parts or the machine won’t work. This model has the added features of guards covering your hands on the handles and the splitter returning to the starting position if the handles are released. The logs are also held in place by toothed grippers that are built in to the hand guards. If you’ve got some heavy duty, high volume splitting to do, this petrol log splitter is your best option. However, it might be a little outside of some customer’s price range. That review brings to a close our article and reviews on log splitters in the UK. We have similar articles on this site for all kinds of gardening tools that are just as informative, so be our guest and take a look if you require information on lawnmowers, pressure washers, chainsaws and many more subjects. We hope you have enjoyed this article and found it helpful and informative.